Possible Side Effects: May see lack of appetite, drooling, vomiting, or diarrhea. Less commonly may see signs of liver disease, including jaundice (yellowing of the gums, skin, or eyes). Consult your veterinarian if you notice any of the above side effects. If your pet experiences an allergic reaction to the medication, signs may include facial swelling, hives, scratching, sudden onset of diarrhea, vomiting, shock, seizures, pale gums, cold limbs, or coma. If you observe any of these signs, contact your veterinarian immediately. Precautions: Not for use in animals hypersensitive (allergic) to penicillins or beta-lactam antibiotics such as cephalosporins. Amoxicillin crosses the placenta, and it is advised not to use amoxicillin/clavulanate in pregnant animals although no detrimental results to fetuses have been reported. Use with caution in very small animals who may be dehydrated or have kidney or heart disorders. Treatment should not exceed 30 days. Human Precautions: People with hypersensitivities (allergies) to penicillins or beta-lactam antibiotics, such as cephalosporins, should not handle the amoxicillin/clavulanate as allergic reactions could occur just from contact. 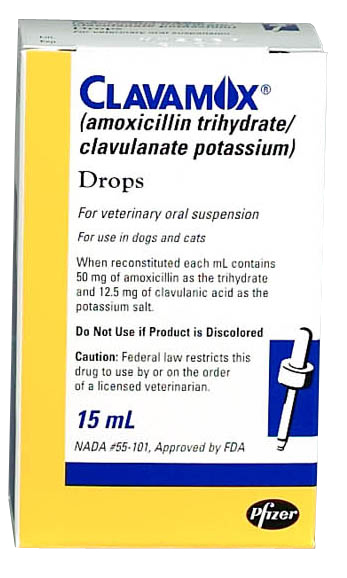 Drug, Food, and Test Interactions: Consult your veterinarian before using amoxicillin/clavulanate with vitamins, suppliments, bacteriostatic drugs, such as erythromycin or tetracyclines, and anticoagulants (blood thinners, such as heparin or warfarin), since interactions may occur. Signs of Toxicity/Overdose: May see vomiting or diarrhea. Dogs on high doses or long-term use may show signs of incoordination (difficulty walking). If you know or suspect your pet has had an overdose, or if you observe any of these signs in your pet, contact your veterinarian immediately. Keep this and all other medications out of the reach of children and pets. ** This information may not cover all possible uses, directions, side effects, precautions, allergic reactions, drug interactions, or withdrawal times. Always consult your own veterinarian for specific advice concerning the treatment of your pet.